My immediate reaction was it looked like a Sambo or blackface type of doll. What I don’t get is the “lifelike” description. It looks to me like some sort of animal I can’t describe, I don’t see anything about it that resembles a human being. I could only imagine the rage I would probably feel if someone gave this doll to my child. With the exception of a couple of gossip blogs and a few websites, the incident was barely a blip on the radar in celebrity news. Ms. Jackson didn’t elaborate on who gave her the doll or where she received it. 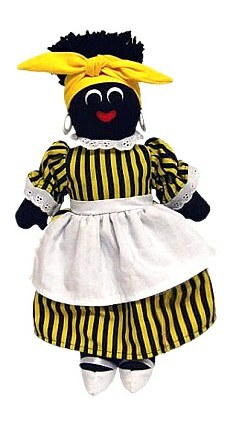 It makes me wonder was the person giving this kind of gift aware of what this type of doll symbolizes for African Americans? Some folks will immediately recognize this as a golliwog doll. According to Wikipedia, the origin is attributed to Florence Kate Upton, an American-born daughter of British immigrants who after emigrating back to England developed the gollliwog as a children’s storybook character, based on blackface minstrel tradition in the United States. Upton’s books featuring the golliwog character became immensely popular in England, and subsequently, the golliwog image was featured on various products, such as dolls, jewelry, and most notably as a trademark on British manufacturer James Robertson & Sons jams and preserves. The same folks who currently feature the cuddly Paddington bear. In light of notable racially motivated murders of black folks like Michael Griffith, Yusuf Hawkins, James Byrd, & most recently Trayvon Martin, they way the world views black folks it really seems the more things change, the more they stay the same. The sameness negates the changes for me. Although there are things I can do now as a black woman that couldn’t be done 200 hundred years ago (go to school, hold a professional job etc), the sameness creates the same type of environment as 200 years ago. That environment where black children/men are killed just by virtue of being black. That environment that pays me less than my white counterpart although I’m working five times harder and longer. That environment where institutional racism is alive and well. No wonder “golliwogs” are still being produced and thought of as a “gift”.